"Going green" is all the rage, and many people are doing their part by switching to energy-efficient light bulbs. But, says environmental lifestyle expert Danny Seo, not all "green lights" are created equal. In the first installment in a monthly Early Show series, "Going Green," Seo explained the differences between "regular" bulbs and the newer ones, and how to find the right "green" bulbs for various parts of your home, and various tasks. Compact fluorescent light bulbs save electricity and save the environment, too. But many people complain that CFL bulbs can be too harsh and bright compared to traditional incandescent bulbs. But Seo says knowing how to choose the right energy-saving bulb for the right task will go a long way toward making you happy with your selection. FACT: If every American home replaced just one light bulb with an Energy Star qualified bulb, we would save enough energy to light more than 3 million homes for a year, more than $600 million in annual energy costs, and prevent greenhouse gases equivalent to the emissions of more than 800,000 cars. FACT: You save about $30 or more in electricity costs over each bulb's lifetime. The average U.S. household has 45 light bulbs; replacing that number of 75-watt incandescent bulbs with CFLs would save $180 per year. FACT: CFL bulbs produce about 75 percent less heat, so they're safer to operate and can cut energy costs associated with home cooling. CHEAPEST BULB: If the higher cost of a CFL bulb is stopping you from stocking up, think Ikea. Its SPARSAM 3-pack CFL set costs just $3.99 (available in IKEA stores). The bulbs are designed to last six times longer and use 80 percent less energy, and will last up to 6,000 hours. The light cast from the bulbs is harsh, bright and white — just like the old-fashioned CFL bulbs — so use these bulbs in little-used areas such as the basement, laundry room, or garage, where the quality of light isn't an issue. TIP: Try swapping out a white lampshade with a black one to help diffuse the light. Ikea also scores for an energy-saving bulb that's designed to diffuse the bright light to be a softer glow. Also part of their SPARSAM collection of light bulbs, the bulb has a silicone rubber covering that helps diffuse the light. Use these in high-traffic areas where lights are constantly turned on, such as the bathroom, and in a reading lamp. These are designed to last up to 10,000 hours. DIMMABLE BULBS: The other biggest complain about CFL bulbs is that they don't work with a dimmer. To use one with a dimmer switch, you must buy a bulb that's specifically made to work with dimmers (check the package). GE makes some dimming compact fluorescent light bulbs (called the Energy Smart Dimming Spirals) that are specially designed for use with dimming switches. UNUSUAL FIXTURES: There are energy-saving bulbs for the chandelier or vanity mirror in the bathroom, too. Philips Vanity Globe CFLs are designed for bathroom vanity fixtures. Since these fixtures are usually designed with exposed bulbs, Philips uses a phosphor coating mix to help soften the bright light and mimic the warmth of incandescent bulbs. These bulbs also use 70 percent less energy than traditional light bulbs. For chandeliers, look for decorative candle-shaped lights using energy efficient light technology. These lights will work with most chandeliers and clip-on shades can snap right on top; this will also help diffuse the light a bit more, too. MIMICS AN INCANDESCENT BULB: Westinghouse Household Compact Fluorescent Bulbs, Mini-twist Style, are for interior standard base light fixtures. The 9-watt bulbs are equivalent to a 40-watt incandescent bulb and have an average life of 8,000 hours. Available at Ace Hardware stores. Philips Classic is also a good choice. Perfect for high-ceiling fixtures such as overhead lights and illuminating ceiling fans, these bulbs cast a soft white light and last up to six years, making them a good, hassle-free choice. SPOTLIGHTS: Outdoor floodlights can be a real energy hog; a traditional spotlight uses 100 watts of energy and can be left turned on all night if the home doesn't have a motion sensor for outdoor flood lights. Gaiam's floodlight looks like a regular bulb, but has a CFL bulb inside, covered by a hard glass cover that mimics a floodlight. It puts out the same light as a 100-watt incandescent bulb, but uses only 23 watts of energy; over the life of the bulb (10,000 hours), the average home will save $92 in energy costs. SOLAR INDOOR LIGHTING: For an outdoor tool shed, this solar-powered shed light is the perfect solution to install lighting where you don't have existing electric work. Brookstone's solar powered shed light uses an adjustable solar panel that charges up outside during the day. Two 8-watt fluorescent bulbs mount to the inside of the shed; a full-charge will give you four hours of light, more than enough light to find what you need inside the shed. NEXT TECHNOLOGY: Light-emitting diodes (LEDs) are tiny, yet powerful sources of light that are even more energy-efficient than CFLs. Manufacturing LEDs that produce the light equivalent to a 60-watt bulb is expensive, however. One bulb can cost as much as $75, but they last 10 times LONGER than a CFL bulb, or 60,000 hours with a total cost of energy of just $12 to power that bulb for the full 60,000 hours. TIP IF YOU CAN'T LIVE WITHOUT INCANDESCENT BULBS: Then choose a lower wattage bulb. 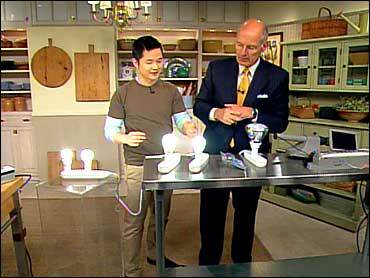 Instead of a 60-watt bulb in a lamp, try something with less wattage, such as a 40-watt bulb. It's using less electricity, but you won't reap as much savings in electricity costs and the bulbs will need to be replaced more frequently. TIP FOR RECYCLING YOUR LIGHTBULBS: CFLs contain a small amount of mercury and should be disposed of properly — ideally, recycled. According to the Environmental Protection Agency, CFLs contain an average of five milligrams of mercury, which increases the bulb's efficiency. But that also means you can't just trash them; CFLs must be properly recycled. Ikea is one national retailer with a recycling center in their stores to take old CFL bulbs back for recycling. Also, visit EARTH911.org and type in "CFL" and your city/state to find a recycling center near you.